Tony Stark: Well, it's time for me to tap out. Maybe I should take a page out of Barton's book. Build Pepper a farm, hope nobody blows it up. Steve Rogers: The simple life. Tony Stark: You'll get there one day. Steve Rogers: I don't know. Family, stability... The guy who wanted all that went in the ice 75 years ago. I think someone else came out. 30.3.2019 I think someone else came out. 30.3.2019 That man has no regard for lawn maintenance. Tony Stark: Romanoff. You and Banner better not be playing "hide the zucchini." Natasha Romanoff: Relax, shellhead. Not all of us can fly. What's the drill? Tony Stark: This is the drill. If Ultron gets a hand on the core, we lose. 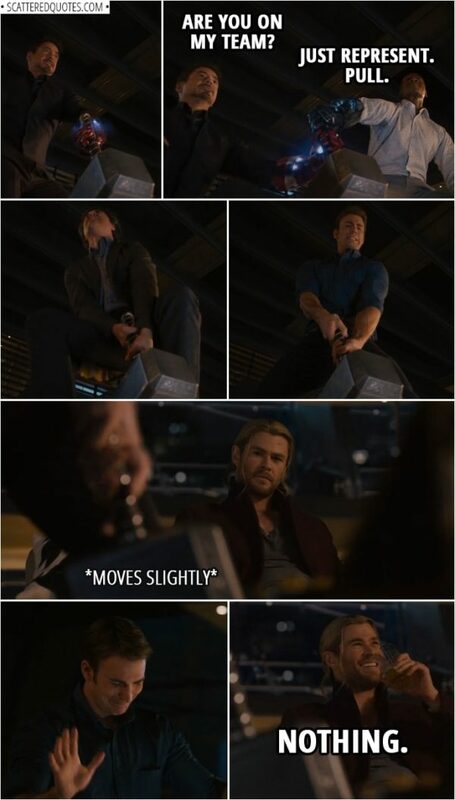 Steve Rogers: You had to ask. Ultron: This is the best I can do. This is exactly what I wanted. All of you against all of me. How can you possibly hope to stop me? Tony Stark: Well, like the old man said... (looks at Steve) together. 30.3.2019 All of you against all of me. 30.3.2019 Incoming already came in. Tony Stark: We can create Ultron's perfect self without the homicidal glitches he thinks are his winning personality. We have to. Jarvis: I believe it's worth a go. 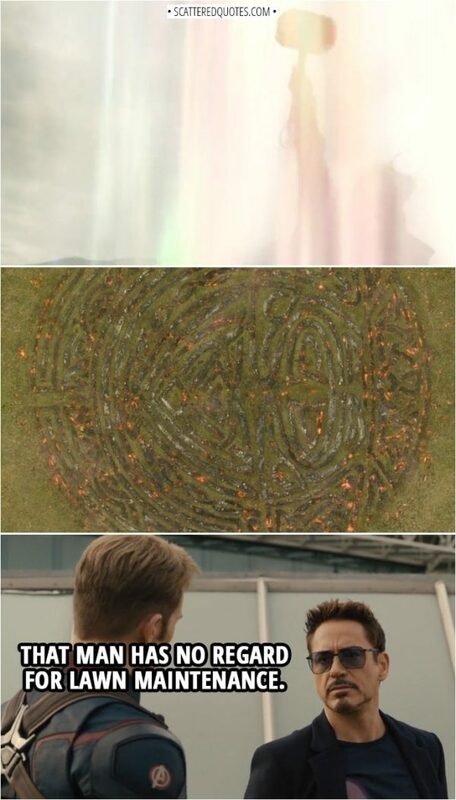 Bruce Banner: I'm in a loop! I'm caught in a time loop. This is exactly where it all went wrong. Tony Stark: I know. I know. I know what everyone's gonna say. But they're already saying it. We're mad scientists. We're monsters, buddy. We've gotta own it. Make a stand. It's not a loop. It's the end of the line. 30.3.2019 We’re mad scientists. We’re monsters, buddy. 30.3.2019 Do me a favor. Try not to bring it to life. 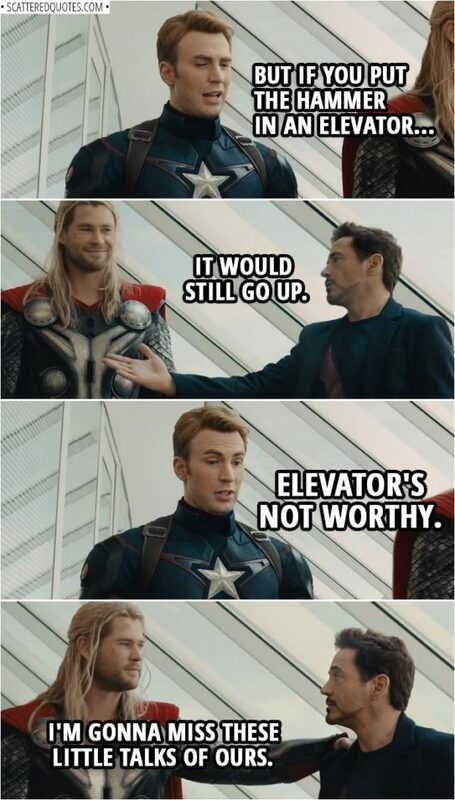 Steve Rogers: Sorry for barging in on you. Tony Stark: Yeah, we would've called ahead, but we were busy having no idea that you existed. 30.3.2019 We were busy having no idea that you existed. 30.3.2019 These are smaller agents. Ultron: Finance is so weird. But I always say, "Keep your friends rich and your enemies rich and wait to find out which is which." 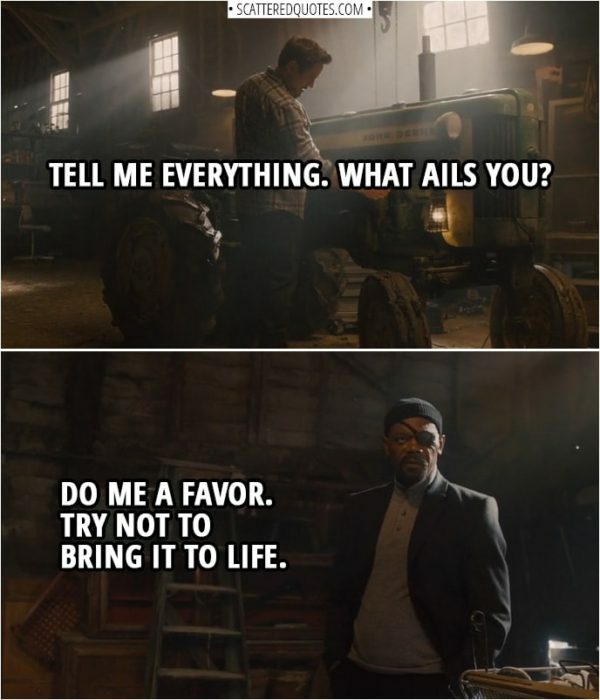 Ulysses Klaue: Tony Stark used to say that. To me. You're one of his. 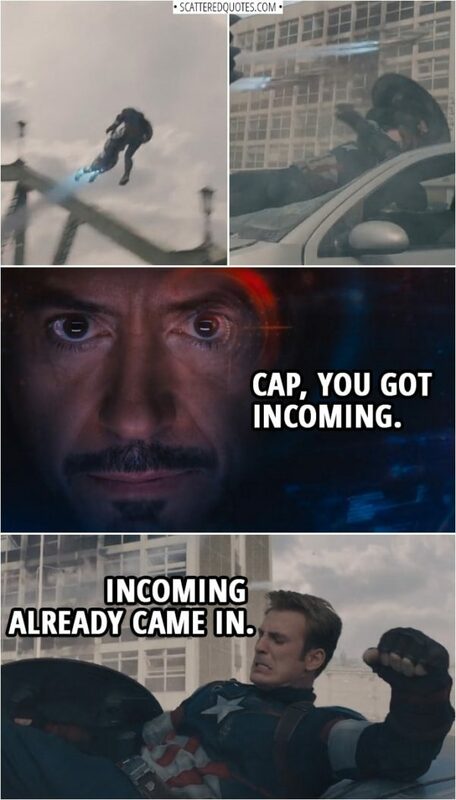 Ultron: What? I'm not... I'm not. You think I'm one of Stark's puppets? His hollow men? I mean, look at me. Do I look like Iron Man? Stark is nothing! (Cuts off Ulysses' arm) I'm sorry. I'm... I'm sure that's gonna be okay. I'm sorry. It's just that I don't understand. Don't compare me with Stark! It's a thing with me. Stark is... He's a sickness! Tony Stark: Ah, Junior. You're gonna break your old man's heart. Ultron: If I have to. 30.3.2019 Don’t compare me with Stark! Ultron: How could you be worthy? You're all killers. Ultron: I'm sorry, I was asleep. Or I was a-dream. Tony Stark: Reboot Legionnaire OS. We got a buggy suit. Ultron: There was this terrible noise. And I was tangled in... In... Strings. I had to kill the other guy. He was a good guy. Steve Rogers: You killed someone? Ultron: Wouldn't have been my first call. But, down in the real world, we're faced with ugly choices. Ultron: In the flesh. Or, no, not yet. Not this chrysalis. But I'm ready. I'm on mission. Ultron: That was dramatic. I'm sorry, I know you mean well. You just didn't think it through. You want to protect the world but you don't want it to change. How is humanity saved if it's not allowed to... evolve? With these? These puppets. There's only one path to peace. The Avengers' extinction. (Thor breaks Ultron's suit) I had strings, but now I'm free. 30.3.2019 I had strings, but now I’m free. 30.3.2019 If I lift it, I then rule Asgard? Maria Hill: Where are the ladies, gentlemen? Tony Stark: Ms. Potts has a company to run. Thor: Yes, I'm not even sure what country Jane's in. Her work on the Convergence has made her the world's foremost astronomer. Tony Stark: And the company that Pepper runs is the largest tech conglomerate on Earth. It's pretty exciting. Thor: There's even talk of Jane getting a Nobel Prize. Maria Hill: Yeah, they must be busy, because they would hate missing you guys get together. (pretends to sneeze while saying the word): Testosterone! Oh, my goodness. Excuse me. 29.3.2019 They would hate missing you guys get together. Tony Stark: We can only do it while we have the scepter here. That's three days. Give me three days. Bruce Banner: So you're going for artificial intelligence, and you don't want to tell the team? 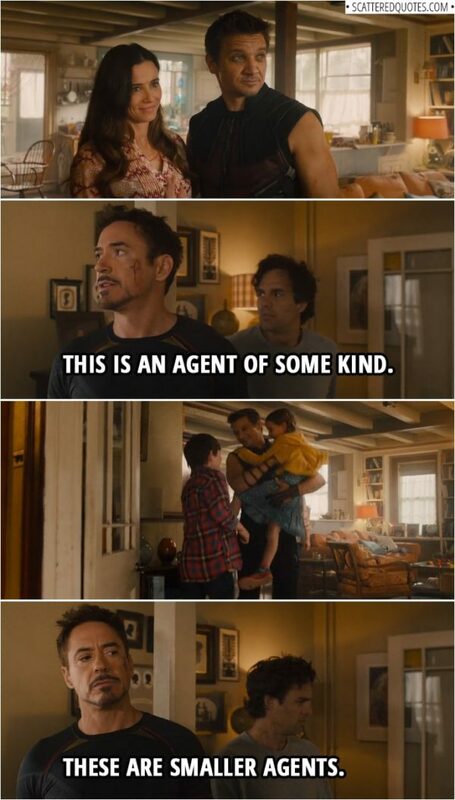 Tony Stark: Right. That's right. You know why? Because we don't have time for a city hall debate. I don't want to hear "the man was not meant to meddle" medley. I see a suit of armor around the world. Bruce Banner: Sounds like a cold world, Tony. Tony Stark: I've seen colder. This one, this very vulnerable blue one, it needs Ultron. Peace in our time. Imagine that. 29.3.2019 I see a suit of armor around the world. Tony Stark: Helen, I expect to see you at the party on Saturday. Helen Cho: Unlike you, I don't have a lot of time for parties. Will Thor be there? 29.3.2019 Will Thor be there?